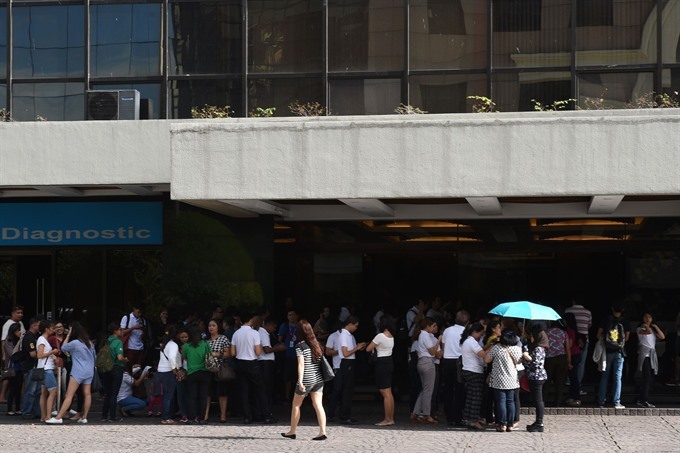 MANILA — A trio of strong earthquakes damaged buildings and caused panicked tourists to flee a popular dive resort near the Philippine capital on Saturday, officials and eyewitnesses said. There were no immediate reports of casualties from the quakes, the strongest of which hit the coast close to Mabini, a resort town south of Manila famous for its marine life and coral reefs. The first 5.5-magnitude temblor struck inland at 3:08 pm (0708 GMT) followed by a 5.9 quake just a minute later, according to a revised report by the US Geological Service. The first quake was earlier reported as 5.7 magnitude. A 5.0 quake hit in the same region after another 20 minutes, according to US geologists. "I was in the pool taking diving lessons when the ground shook.... We all climbed out and ran. Concrete slabs were falling," Filipino tourist Arnel Casanova, 47, said by telephone from a Mabini dive resort. "When I went back to my room the ceiling had collapsed and the glass windows were broken, but so far everybody is safe," said Casanova, who was at the resort with his 20-year-old son. He said resort guests remained outside the damaged buildings more than an hour later as the area was hit with aftershocks. The quakes caused landslides which blocked two roads and damaged an old church, a hospital and several houses in the area, local officials told ABS-CBN television. "We are evacuating some people who live on the coast. We want them to stay in a safe area tonight," Mabini Mayor Noel Luistro told the station. He said he expected at least 3,000 residents to move inland in case of further aftershocks, although the state seismology office said there was no threat of tsunamis. "The town is full of tourists, both local and foreign this weekend," he added. The network also broadcast live footage of frightened commuters fleeing the passenger terminal at the port of Batangas, near the epicentres. The quakes caused power outages across the region but caused no casualties, said Romina Marasigan, spokeswoman for the National Disaster Risk Reduction and Management Council. In Manila, about 100 kilometres away, AFP reporters saw people running out of office buildings in the financial district. The Philippines lies on the so-called Ring of Fire, a vast Pacific Ocean region where many of the world’s earthquakes and volcanic eruptions occur. Saturday’s quakes were caused by the movement of a local fault, Philippine Institute of Volcanology and Seismology chief Renato Solidum said on ABS-CBN television. A 6.5-magnitude quake killed eight people and left more than 250 injured outside the southern city of Surigao in February, and another 5.9-magnitude tremor killed one person there last month.